The MyTown shopping experience is diverse. A full service salon, apparel, gifts and a whole lot more! Come stroll the sidewalk with some friends, and maybe even make some new ones! My Town Gift cards are perfect for the person who has everything! Purchase them at any MyTown store, use them at any store! Want to spend a little bit here, a little bit there? No Problem! Ask the clerk at any of our stores for more information. Heart of Kansas, Miss Pretty Pickles and Perk’s. 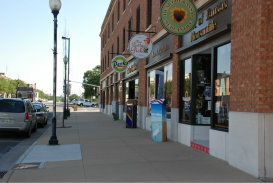 Three My Town Stores on Main Street in downtown Great Bend. Welcome to My Town! Our vision is the revitalization of downtown Great Bend. We are not only attracting business, but also a talented workforce to our local economy. We continue with our vision to transform downtown Great Bend into an appealing attraction which will help retain youth and attract young families to our area. We have accomplished much of our vision already. My Town has owned and operated several businesses for over five years downtown. Over $1.4 million has been invested in real estate and renovations. Sales continue to increase year after year. We have worked with local leadership to transition to more customer friendly parking downtown. There is still more to do! Our next phase includes business incubation and a white tablecloth restaurant, all steadily moving from conception to reality! Hear what other business owners have to say about the My Town project. We picked downtown Great Bend, Kansas as a prime location to start our retail business because of the synergy around the My Town project. We feel like the downtown area is headed in a good direction – the right direction. Retail businesses are not so much competitors as they are co-conspirators, especially in a downtown setting. We all benefit from the draw created by the other businesses and the My Town stores have significantly increased downtown foot traffic. Our family-owned business has been in downtown for over 50 years. The value of doing business in this location has increased substantially since the MyTown Stores opened. Going downtown no longer seems out of the way for our customers. It’s a destination. Kenny Vink, Office Products, Inc.